Syringa Provincial Park offers volunteer host opportunities. Syringa Provincial Park is located in south central BC near the southeast end of the Lower Arrow Lake. The lake is a part of the Columbia River that was widened and deepened with the construction of the Hugh Keenleyside Dam at Castlegar. Recreation opportunities on the Arrow Lake Reservoir have made the park a long time popular destination and offer a comfortable base camp for the family to pursue a variety of recreational pursuits including fishing, boating and swimming. Explore local history and visit the Doukhbour Village Museum and Zukerberg Island located in nearby Castlegar. Stay Safe: Lake weather can change rapidly, be prepared. Visitors should be aware that high winds could come quickly. Gate is closed during the off-season. Located in south central B.C., 19 km northwest of Castlegar on Hwy 3A. Depending on your direction of travel look for the Robson exit just before or after you cross the bridge over the Kootenay River. The park is a 25 minute drive from Castlegar. History: The park was named for Syringa Creek, which flows into the Lower Arrow Lake near the park’s eatern or southeastern boundary. The “Syringa” or Mock Orange is a shrub which is indigenous to the area. It blooms in early spring showing clusters of white flowers with bright yellow stamens that emit a powerful, pleasing fragrance. First established in 1968 to provide recreational opportunities, the park was increased to its present size in 1995 to protect a provincially significant ecosystem. Cultural Heritage: This area is significant to the Okanagan, Shuswap, Sinixt, and Ktunaxa/Kinbasket First Nations. It encompasses areas of cultural and spiritual values and three pre-contact sites. Conservation: The moderately dry and warm climate of this part of the West Kootenay is conducive to the growth of plants and trees like bunchgrass and ponderosa pine that are not normally found in the region. It contains beaches, grasslands, open and closed pine forest, rock outcroppings and canyons. It is important seasonal range for rocky mountain bighorn sheep, elk, deer and cougar. Many bird species inhabit the parks’ forest and grasslands including white-throated swifts, canyon wrens nesting in the rock bands and great blue heron at the waters edge. Wildlife: Park users should always be aware of bears and other wildlife in our park environment. Never feed or approach bears or other wildlife. Please view all wildlife from a distance. The management plan for Syringa Park was approved in May 2017. Lower Arrow Lake can provide excellent fishing for rainbow or bull trout, and kokanee salmon. Anyone fishing or angling in British Columbia must have an appropriate licence. Check the BC Fishing Regulations Synopsis for quotas and restrictions. The Yellow Pine Nature Trail is a year-round trail, approximately 4 km long and takes 45 minutes to an hour to reach the top look out. It has 3 access points - From the south end of the park, on the topside of the main access road. On Deer Park road, directly above the gate house and from the edge of the day-use/picnic area parking lot, continuing across Deer Park road. The trail climbs the hillside behind the park, is fairly steep and considered a moderate hike. Yellow Pine Trail takes you through mature yellow pine, past several granite rock outcroppings and offers intermittent views of Arrow Lake from a terraced hillside. Rest and enjoy the view from the first lookout or go all the way to the summit. Both lookouts have benches. 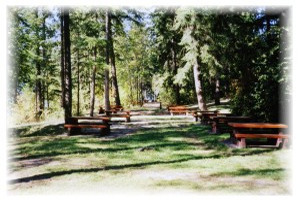 An additional 2 km of trail links the picnic area with the campground. For your own safety and the preservation of the park, obey posted signs and keep to designated trails. Shortcutting trails destroy plant life and soil structure. Hunting is allowed in this park. Please check the BC Hunting & Trapping Regulations for more information. This park has a designated “off leash” area but in all other areas of the park, pets/domestic animals must be on a leash at all times and are not allowed in park buildings or beach areas. You are responsible for their behaviour and must dispose of their excrement. Backcountry areas are not suitable for dogs or other pets due to wildlife issues and the potential for problems with bears. As Syringa Park is on a reservoir, the water does fluctuate from spring through fall. The water level is low in May, rises in June and is at full pond for July, August and September. There are three beaches: Camper’s Beach adjacent to the campground, Boater’s Beach at the boat launch and Main Beach at the primary day-use/picnic site. The upper portion of the beaches is sand with the lower portion rocky, which is mostly exposed at low water. For 6 weeks in the summer during high water, Main Beach has a roped off swimming area with a maximum depth of six feet. The water temperature is described as refreshing to cool however with three choices and a combined 450 metres of sandy beach, the park provides an abundance of sunbathing and swimming opportunities. There are NO LIFEGUARDS on duty at provincial parks. Waterskiing opportunities are available on Lower Arrow Lake; access at the park. Due to a north wind on Lower Arrow Lake, there are good windsurfing opportunities. A doublewide, concrete boat launch at the southeast end of the park has a large, gravel vehicle/boat trailer parking area with a capacity for 85 cars. Boat trailers can be parked overnight and boats are sometimes left in the water or beached, but the shoreline offers no protection against weather changes. Visitors do enjoy waterskiing and windsurfing. The Big Horn RV sites #62 to #70 have been electrified. Sites #62 to #68 have 50 amp and #69 & #70 have 30 amp service. All are good sized and have fire pits. All sites may be reserved through Discover Camping. An additional service charge of $7.00, per night, applies to these sites regardless of whether electrical service is used. Are you planning a family reunion, church outing, youth trip or a gathering of friends? The Sturgeon Point Group site is available to book up to 12 months in advance. The group campsite is open from May 5 to October 2. Click here for reservation information. This park has three day-use/picnic areas. As Syringa Park is on a reservoir, the water does fluctuate from spring through fall. The water level is low in May, rises in June and is at full pond for July, August and September. The upper portion of the beach is sand with the lower portion rocky, which is mostly exposed at low water. Barbeque stands and fire rings are not available. The main picnic area is located northwest of the campground along the lake. The beach is 250 metres long with 30 picnic tables located on a raised partially shaded grassy terrace in front of the beach. A toilet/change house, 2 pit toilets and water taps are available for day users. This day-use/picnic area is the largest in the park, with a paved parking lot that can accommodate 220 vehicles. As indicated by its name Boat Launch day-use/picnic area with its 150 metre beach, 6 picnic tables and 4 pit toilets can be found at the boat launch in the south end of the park just past the park entrance. Camping day-use/picnic area is located in front of the campground and is primarily used by campers. The beach is 50 metres long and has 7 tables. The campground washrooms and water taps are nearby. This day-use/picnic area hosts the only adventure playground, in the park. The playground is set in sand with a swing set, monkey bars, slide and spring horse. Two sets of pit toilets and two toilet buildings are conveniently located throughout the campground. Main beach day-use/picnic area has two pit toilets and one toilet building. Boat Launch day-use/picnic area has four pit toilets. An adventure playground with swing set, monkey bars, platforms, slide and spring horse is located in the campground area near Campers’ Beach. The equipment is set in sand. A sani-station/dump is available during the collecting season and is located just past the gatehouse. There are showers at this park. The park has two campgrounds with vehicle accessible sites. All the sites are gravel and the road in the Main Campground is paved; the road in Big Horn is packed gravel. There are no pull through campsites, however, all the sites in Main Campground are considered large and will accommodate bigger rigs. The Big Horn RV sites are generous, back in, gravel pads with electrical service. The Big Horn Loop sites are on the smaller size, more suitable for tents, campers and smaller RVs. All sites provide limited parking for extra vehicles. The Main Campground is one large loop with one cross road at its center. The Big Horn is adjacent to the day-use area with most sites overlooking the lake. The majority of the sites are shaded in a mixed forest of fir and pine. The park offers services during the peak season of May to September. Campsite reservations are accepted and first-come, first-served sites are also available. Visitors can select any non-reserved site and staff will come to collect fees. A gatehouse with a pay phone is located about 2 km from the park entrance sign. The closest store is Scottie’s Marina 1.5 km from the park. BC Senior’s Rate (day after Labour Day to June 14 only): $13.00/senior party/night camping fee plus, if applicable, $7.00 electrical/night = $20.00/party/night. Read the User Fees Policy for information on Senior Camping Discounts. Wheelchair accessible facilities in this park include flush toilets in the toilet building(s) at the main day-use/picnic area and campground. From the main day-use/picnic area a paved pathway is available to allow access to the picnic tables. The surface area between the tables is gravel and grass.